Blood Flow Restriction Training: Does It Really Work? Can blood flow restriction really lead to muscle growth? When it comes to new forms of training I’m probably one of the most skeptical people out there. And the concept of blood flow restriction training initially got my standard reaction. Because, based on past experience, I’m naturally dubious of a new crazy rep scheme that appears in some fitness magazine. Or a fad diet that an actor is screaming from the Hollywood hills about, because it helped him or her get shredded for their latest movie. To me, it alls falls into the category of waist trainers and Herbalife products. It all just sounds too good to be true. And you know what 99% of the time it is. So with that in mind, when I first heard that there was a method of training involving blood flow restriction, my immediate thought was that this automatically falls into the 99% category. I had visions of neanderthal bodybuilders getting tips from local drug users about the best way to make those veins pop. But what if I told you that there’s some truth in in it? What if I was to tell you that my initial thoughts were completely wrong? What if I was to tell you that the process of blood flow restriction can actually have a positive effect on muscle growth? And the theory is backed by the scientific research? You’d be interested right? Well this blog is going to fill you in on all the details and guide you through what it is and how to use it to further enhance your training. I’m going to show you why Blood Flow Restriction Training (BFR) is actually in the 1%. Blood Flow Restriction is a pretty pretty simple concept (which is part of the reason I’ve come to love it). The principle behind Blood Flow Restriction is to restrict the venous return of blood from your muscles. That essentially means you are allowing blood to flow freely into the muscle (arterial blood flow), but you are restricting it coming back out. And this creates a blood pooling effect in the muscles. We’ll come on to why that’s beneficial very soon. And that first point is an important point worth labouring on for a little bit longer. Because you do NOT want to restrict arterial blood flow into your muscles. That would definitely be bad. And it could lead to some significant issues if that level of restriction was applied for a period of time. So it’s important to make sure you know what you’re doing before you consider starting Blood Flow Restriction training. Because, if you get it wrong then it’s either going to be of no benefit at all or it’s going to cause you problems. The restriction needs to be applied to the the legs or arms through the use of a cuff. And there are a number of ways you can do this. One option is to buy bands and cuffs specifically for this type of training. However, I’ve found that simply using a cheap set of cloth knee wraps will be perfectly fine and do the job. They’re long enough and wide enough to get the right level of restriction comfortably. The restriction can be applied to the limbs of the body, ie the arms and legs. There’s no point trying to do Blood Flow Restriction training for chest, back, shoulders for example. You simply won’t be able to apply a restriction there. If we use the arms as an example, you can use Blood Flow Restriction to assist your tricep and bicep training. In this case you would apply the wraps (or whatever method of restriction you choose) at the top of the bicep and as high up into your armpit as you can get it. You then want to tighten the wraps so they are about a 7/10 in terms of how tight they feel. That will make sure you get the benefit, without risking the restriction of blood flow into your muscles. If you want some more tips on how to apply the technique then watch this video. What are the alleged benefits? The benefits of Blood Flow Restriction are mainly centred around the fact you can use much lighter weights to get the same effect as heavier weight training. This study concluded that multiple sets of low-intensity resistance exercise with continuous Blood Flow Restriction could achieve the same metabolic stress as multiple sets of high-intensity resistance exercise. So you can use around 20-50% of your normal weights and get the same effect. Why is this good? As an seasoned lifter will know, heavy weightlifting can eventually take its toll on your body. Your joints and ligaments can take a bit of a battering, which if not managed correctly can lead to injuries that can set you back significantly in your progress. Most weightlifters will manage this by either taking a complete week off or opting for a deload week every 8 weeks or so. Now the great thing about BFR training is that you can take that deload week and still make gains, whilst giving your joints and ligaments the break they need. Blood Flow Restriction is also of great benefit if you have an injury which restricts you from using heavy weights. If you’re a regular reader of the blog then you’ll know that this is a situation I’ve had to deal with myself in recent years. My broken hip means that heavy squats can be painful and also risky as my flexibility is limited. In this scenario Blood Flow Restriction training has been a welcome addition to my training. It’s allowed me to continue my recovery and develop mass in my leg muscles without the risk of doing more damage. What does the science say about Blood Flow Restriction Training? So we’ve covered a couple of benefits of Blood Flow Restriction training. But here are a few more, as well as the links to the research that backs up the claims. One Study found that cell swelling was caused by combination of blood pooling, accumulation of metabolites, and reactive hyperemia (excess of blood) following the removal of Blood Flow Restriction which may contribute to skeletal muscle adaptations that occur with Blood Flow Restriction. Another Study showed Blood Flow Restriction helps prevent the loss of muscular strength when immobilised. This Study showed increased muscle size and strength from walking when combined with Blood Flow Restriction. Yet another Study showed increases in muscle activation and thickness. Finally, this Study showed substantial gain in muscle endurance capacity with Blood Flow Restriction. What’s going on in your muscles when you restrict blood flow? 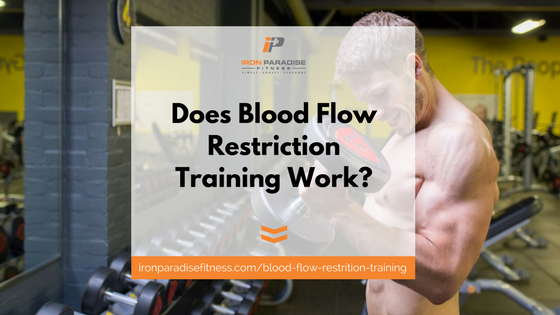 Now we now what Blood Flow Restriction training is and what the benefits are, we’re now going to look at the what is actually going on within your muscles when you restrict blood flow while training. Your fast twitch muscle fibres are the ones that have the most potential for growth and the ones that you are mainly targeting with your weight training. Blood Flow Restriction training assists in working these muscles by pre-exhausting your slow twitch muscle fibres, thereby forcing those fast twitch bad boys to get to work and manage all the work even when you’re using much lighter weights. If fast twitch muscle fibres are good for building muscle and getting that aesthetic look, then that makes this study all the more interesting to read. It’s a study conducted at the University of Tokyo that looked into the effect of venous restriction in the hind legs of rats. It was specifically set up to understand if there is a change in muscle fibre composition through the use of occlusion. Interestingly, the research concluded that there is a definite correlation between venous restriction and the change in muscle fibre composition. There was a decrease in type 1 slow twitch fibres and an increase in type 2 fast twitch fibres. Assuming this hypothesis would translate across to humans, Blood Flow Restriction training would be very beneficial for bodybuilders and those seeking a more muscular and toned physique. In addition to the activation of fast twitch muscle fibres and the potential change in composition, Blood Flow Restriction training is doing even more positive things within your muscles. And then there’s that pump! I’m not one for chasing ‘da pump’ in the gym. It definitely shouldn’t be the main goal of your workouts. However, if you’re an intermediate or advanced lifter then it shouldn’t be ignored and it can be a valuable aspect of your training. Blood Flow Restriction will give you the most insane pump you will ever experience. Imagine the most vein popping, skin ripping workout you’ve ever had and multiply it by a thousand. It burns like nothing else. And it’s this level of pump that’s bringing you added benefit. When you apply the restriction you are not only restricting the blood flow, you are also trapping in muscle building metabolites, which would otherwise be washed away. This will include the build up of lactate, which is thought to have a positive impact of Growth Hormone and in turn muscular development. This study backs that theory up. It concluded that venous restriction had a significant impact on GH. In fact the impact was 290 greater than that of resting levels, which is quite the increase I think you’ll agree. Before we move on to the next section of the article I want to cover off one more process that is thought to be going on within your muscles during Blood Flow Restriction training. This is related to myostatin. What is myostatin? Myostatin is a protein in the body that is thought to limit the amount of muscle growth you can achieve. It’s thought that those genuinely naturally gifted individuals, blessed with great genetics, have naturally low levels of myostatin. Supplement companies have obviously jumped on the bandwagon here in recent years in an effort to produce products, or a least some clever marketing that claims their latest wonder pill reduces myostatin levels, opening the door for limitless gains. You know me well enough by now that I’m going to need an awful lot of convincing on that one! However, research in Japan (yes the Japanese seem to be really hot on their Blood Flow Restriction research) showed that that occlusion resulted in a decrease in myostatin. The important thing to take away here is that Blood Flow Restriction training is helping you make those marginal gains that will help you continue to make gains as an intermediate and advanced lifter, which brings me on to the next section of the article. The process of restricting blood flow while working out sounds a really bad idea on face value and often gets a few raised eyebrows when you first start talking about it with someone. All the research shows that it is actually entirely safe when performed correctly, and that’s the important thing. As we mentioned earlier, if you only restrict venous return and not arterial blood flow then you are not doing anything dangerous. In fact, unless you are a total “no pain, no gain” belligerent moron, then it’s going to be quite difficult to apply the restriction so tight that it will do you some damage. Think about it for a second. You will have to apply that wrap so tight that it will be incredibly uncomfortable. Add to that the sensation of losing feeling in your limbs, which is impossible to ignore, and you can see that it’s going to take a conscious and concerted effort to do yourself some real damage. If you have an ounce of common sense then Blood Flow Restriction is a safe technique for you to try. I’ve been using Blood Flow Restriction training for a number of weeks now and have been finding it highly beneficial. I felt that my leg training had stalled due to my injury and my inability to perform heavy compound lifts. Since using Blood Flow Restriction training there is a noticeable improvement in my quad development as well as my calves. I have been using it on leg extensions, hamstring curls and calf presses to great effect. I’ve also started experimenting with BFR on the leg press, but in all honesty I need to try that out for a few more weeks before determining if it’s adding to my overall size and strength. How should you do it and when should it be used? As good as Blood Flow Restriction training can be for the right person and in the right scenario, it shouldn’t be a replacement for your main strength-based, heavy weight exercises. Over the long-term these are going to be your best ways to improve size and strength. Blood Flow Restriction training should therefore be used as a supplemental training protocol at the end of workouts, or during deload weeks and when recovering from injury, as we covered previously. I also only recommend you only add Blood Flow Restriction to your training plans if you’re an advanced lifter. You need to have formed that base level of size and strength first to get real benefit from it and to be confident you’re doing it correctly as well. Use the technique on exercises such as leg extensions, hamstring curls, calf raises, tricep pulldown, bicep curls etc. Compound lifts are not recommended for BFR training. You need to aim for 3-5 sets at 20-50% of your normal working weight. Your rep range target is c.20-30. As the weight is much lighter than you are used you should be able to push through the pain and keeping smashing out those reps.
Only take around 30 seconds rest between sets and don’t remove the restrictions until you’ve finished the workout. The bottom line is this. Blood Flow Restriction training is a beneficial technique for advanced lifters. And it can be used to supplement a heavy weight training programme. Whether that’s as a finisher to your workout or used during a deload week, Blood Flow Restriction training is going to benefit the development of your physique. It’s going to allow you to keep making marginal gains as a natural athlete, which becomes increasingly difficult the more and more you train. Try this protocol in your routine and open up a new level of muscle growth potential. Now you’ve read how Blood Flow Restriction training works, I hope you’re inspired to put the ideas into practice and hit session to try it out. And I’d also love to help you get on top of your nutrition, so you get maximum benefit from your training. I want to help you get the perfect nutrition plan that gets you to your goals and is full of foods you love. And if that sounds good then I’ve got a free online nutrition workshop you can register for by clicking the image below. In the workshop I’ll walk you through the exact approach I use with all my clients to achieve great results. And it’s also the approach I use to build my own physique.